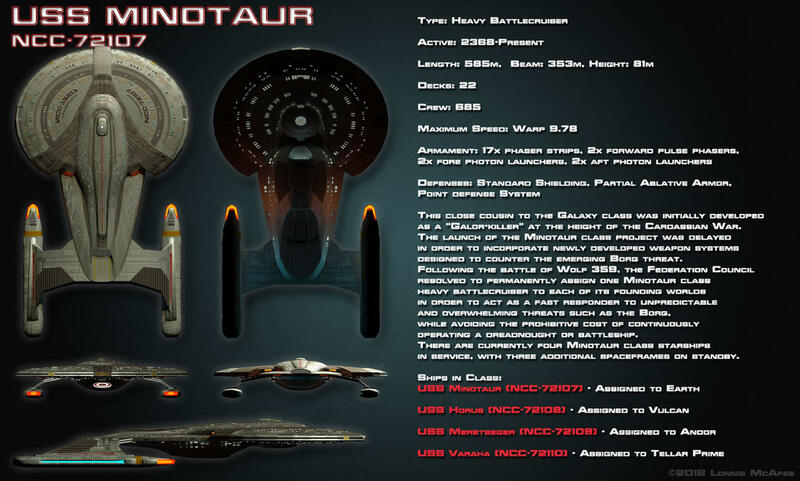 There have been various projects in the works in recent weeks, including the completion of the U.S.S. Exeter and another new Starfleet ship, the U.S.S. Minotaur, among other things. I’ve also been picked up by the team at Bridge Commander 2, who are interested in using my Minotaur and Exeter class designs. I’ve been working on polishing my Illustrator skills, which has yielded some interesting results in my effort to modernize the Enterprise-era NX class, and I hope to start developing some Master Systems Display art for my original designs. Another thing that just occurred to me is that I should actually start constructing an MSD kit for use by the Trek art community. All in all, I’ve managed to be quite productive these last few months. Lastly, but perhaps most importantly, I’ve placed my Last Age projects on the backburner in order to focus on Trek-inspired designs of late, but I’m feeling the itch of the writing bug lately, so that may soon change.